So speaks Peter Thiel in an interview to the Wall Street Journal Technology = Salvation that I read while traveling to Helsinki to discover the Finnish high-tech ecosystem (I will come back on my trip when I am back home). I did not know Peter Thiel was German, I mean one more European migrant to Silicon Valley. 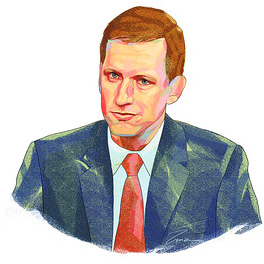 For those who do not know him, Thiel was the business angel in Paypal and then Facebook. “People don’t want to believe that technology is broken. . . . Pharmaceuticals, robotics, artificial intelligence, nanotechnology—all these areas where the progress has been a lot more limited than people think. And the question is why.” […] Innovation, he says, comes from a “frontier” culture, a culture of “exceptionalism,” where “people expect to do exceptional things”—in our world, still an almost uniquely American characteristic, and one we’re losing. […] The idea that technology is broken is taboo. Really taboo. An early investor in Facebook and the founder of Clarium Capital on the subprime crisis and why American ingenuity has hit a dead end. The housing bubble blew up so catastrophically because science and technology let us down. It blew up because our technocratic elite told us to expect an ever-wealthier future, and science hasn’t delivered. Except for computers and the Internet, the idea that we’re experiencing rapid technological progress is a myth. Such is the claim of Peter Thiel, who has either blundered into enough money that his crackpot ideas are taken seriously, or who is actually on to something. A cofounder of PayPal and an early investor in Facebook (his stake was recently reported to be around 3%), Mr. Thiel is the unofficial leader of a group known as the “PayPal mafia,” perhaps the most fecund informal network of entrepreneurs in the world, behind companies as diverse as Tesla (electric cars) and YouTube. Mr. Thiel, whose family moved from Germany when he was a toddler, studied at Stanford and became a securities lawyer. After PayPal, he imparted a second twist to his career by launching a global macro hedge fund, Clarium Capital. He now matches wits with some of the great macro investors, such as George Soros and Stanley Druckenmiller, by betting on the direction of world markets. “This is where [today is] very different from the 1930s. In the ’30s, the Keynesian stuff worked at least in the sense that you could print money without inflation because there was all this productivity growth happening. That’s not going to work today. “The people who bought subprime houses in Miami were betting on technological progress. They were betting on energy prices coming down and living standards going up.” They were betting, in short, on the productivity gains to make our debts affordable. His mundane thoughts these days include whether Facebook should go public. Answer: Not anytime soon. On the specific question of a Facebook initial public offering, he harks back to the Google IPO in 2004. Many at the time said Google’s debut had reopened the IPO window that had closed with the bursting of the tech bubble, and a flood of new tech companies would come to market. It didn’t happen. What Google showed, Mr. Thiel says, is that the “threshold” for going public had ratcheted up in a Sarbanes-Oxley world. Even for a well-established, profitable company—which Google was at the time—the “cost-benefit trade-off” was firmly on the side of staying private for as long as possible. Only one thing troubles him: “I think it’s a problem that we don’t have more companies like Facebook. It shouldn’t be the only company that’s doing this well.” Maybe this explains why he recently launched a $2 million fund to support college kids who drop out to pursue entrepreneurial ventures. In true macro sense, he sees that failure as central to our current fiscal fix. Credit is about the future, he says, and a credit crisis is when the future turns out not as expected. Our policy leaders, though, have yet to see this bigger picture. “Bernanke, Geithner, Summers—you may not agree with the them ideologically, but they’re quite good as macroeconomists go,” Mr. Thiel says. “But the big variable that they’re betting on is that there’s all this technological progress happening in the background. And if that’s wrong, it’s just not going to work. You will not get this incredible, self-sustaining recovery. The system is telling him otherwise. Mankind, says Mr. Thiel, has no inalienable right to the progress that has characterized the last 200 years. Today’s heightened political acrimony is but a foretaste of the “grim Malthusian” politics ahead, with politicians increasingly trying to redistribute the fruits of a stagnant economy, loosing even more forces of stagnation. Mr. Thiel delivers his views with an extraordinary, almost physical effort to put his thoughts in order and phrase them pithily. Somewhere in his 42 years, he obviously discovered the improbability of getting a bold, unusual argument translated successfully into popular journalism. You don’t have to agree with every jot to recognize that his view is essentially undisputable: With faster innovation, it would be easier to dig out of our hole. With enough robots, even Social Security and Medicare become affordable. Some companies and countries will do better than others. “In China and India,” he says, “there’s no need for any innovation. Their business model for the next 20 years is copy the West.” The West, he says, needs to do “new things.” Innovation, he says, comes from a “frontier” culture, a culture of “exceptionalism,” where “people expect to do exceptional things”—in our world, still an almost uniquely American characteristic, and one we’re losing. “If the universities are dominated by politicians instead of scientists, if there are ways the government is too inefficient to work, and we’re just throwing good money after bad, you end up with a nearly revolutionary situation. That’s why the idea that technology is broken is taboo. Really taboo. You probably have to get rid of the welfare state. You have to throw out Keynesian economics. All these things would not work in a world where technology is broken,” he says. Perhaps it really does fall to some dystopian science fiction writer to tell us what such a world will be like—when nations are unraveling even as a cyber-nation called “Facebook” is becoming the most populous on the planet. Mr. Jenkins writes the Journal’s Business World column. This entry was posted in Innovation and tagged Crisis, Thiel, Universities on October 12, 2010 by Hervé Lebret.